Charlie’s kind of sad at being kind of sidelines and hot firemen are not used to being sidelined. While he has a point, Wynonna has way way more going on than Charlie’s feelings or their relationship. She pretty much tells him that they’ll pick this up in Spring and he slopes off in a huff. Look it’s not like he’s not informed here, he knows about the supernatural, he knows about the woo-woo, he knows what’s at stake - he needs some perspective here. Anyway relationship drama aside, Wynonna has a visit from Kevin, a woman and heir to basically the Powers That Be who watch but don’t interfere. Except they totally interfere because THEY ALWAYS DO. This is a genre rule. People who can’t interfere constantly interfere but then have weirdly arbitrary limits so they can’t use their super powers to make things easy. Oh and Kevin is played by Anna Silk. And one of her reasons for helping is that she’s sick of the powers that be boy’s club. Not that Kevin is especially confident with Wynonna Earp and Wynonna isn’t arguing at all about being clueless, under trained or an alcoholic. But she has a lead on a weapon that can kill Bulshar - his arm. His arm which he lost when he was entombed in a dangerous rickety mine (he got a new one). So that’s Waverley and Wynonna off on a road trip. I’m no expert, but I assume anything that radioactive that it causes this much damage on a touch is probably not going to be great to stand in close proximity too anyway. Yes, more Mercedes love from me because she’s so very very very awesome. She’s super happy to have her face back (which they recap, with lots of credit) and totally blase about Revenants following them because she’s Mercedes and this is Purgatory. The revenant arrives but thankfully Waverley discovers some new super powers from the ring - she can control his Bulshar arm and make him strangle himself. 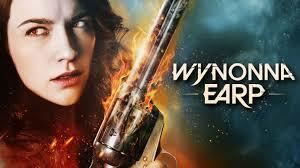 After which Wynonna can rip off his arm because he’s only radioactive when he’s alive? Apparently? And that Champion is Waverley. Because by using the ring - Julian’s ring, an angel’s ring - she’s proven she has the power to defeat Bulshar despite being only half angel (also supported by her healing Mercedes - a miracle). Of course Kevin dumps a whole load of guilt on them but I quite like to see a character who doesn’t jump on the martyrdom train as soon as it arrives. Good on Waverley, not wanting to die isn’t selfish. Of course Waverley feels guilty especially since she’s pretty sure that Wynonna would sacrifice herself -but Wynonna is adamantly insistent that she is going to be selfish - Waverley will not sacrifice herself, they will find another way. More subtle hints about Jeremy being different and having woo-woo. Stop hinting Wynonna Earp! They dodge around talking Maeve out of killing Nicole before finally finding the book - and ghostly Maeve responds by burning the house down which is a problem. With the big drama of Doc fleeing and Waverley trying to live, the fact Robin and Bobo are bonding over Jazz (and the eternal question about whether Bobo is a good man or not) seems minor and absent. Though I do wonder how back to normal Robin is. And Mercedes is kidnapped… she better live!